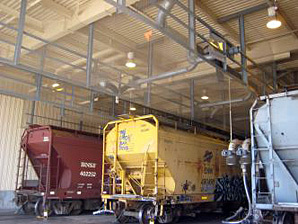 This rail shed - a key terminus for shipping food products - does a great job of keeping the elements off the unloading platform. However, due to its open layout, it also became a busy area for various species of birds looking for shelter too. The intricate network of girders and catwalks made it the perfect spot for roosting and nesting. The main concern of course was that the bird droppings made it an unsanitary mess. Not the type of environment that's ideal for unloading food! Yet there were no easy answers when it came to getting rid of the birds. Because the rail shed is a highly active area, a solution had to be found that would keep birds out but allow trains and workers to move freely. Additionally, the catwalks above had to be unobstructed so that employees could safely and efficiently work above without interruption. Enter Hot Foot. Their bird deterrent experts assessed the situation and custom-designed a netting system to meet all of their needs. 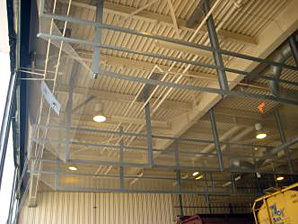 Since netting off the whole entry wasn't an option in this case, Hot Foot designed a system to "spot enclose" the actual roosting and nesting areas using its fine mesh InvisiNet exclusion netting, suitable for all types of birds. Once these barriers were in place and birds could no longer roost in the girders and other nooks and crannies, they flew off for new nesting sites. It was the perfect solution for keeping the birds out humanely without interfering with the workers at all. The result: a 100% effective solution. The birds are now gone, and the unloading area is clean and free of droppings.